Today I'm going to talk about one of the more challenging skills for most squash players, digging the ball out of the back corner. For quite awhile when you start playing, any shot that makes it to the back wall wins the point. On top of the mechanics being an issue, the ball also doesn't get warm and bouncy enough to come off the back wall. Getting shots after they hit the back wall is a slow progression, but a skill that is very satisfying. As you get to a higher standard, (for example, watch the pros this week at the Tournament Of Champions) you will rarely see a player have to boast. They will boast when they want to. At a high standard if you are limited to 1 option your opponent will be all over your shot. How do top players manage to get any shot out of the back corner and back down the wall? It's a long list, which is where I'm going to start. Today I'm going to talk about how to hit a drive when the back corner is interfering with your normal swing. If you have difficulty timing the ball off the back wall when you have space you aren't quite ready for the following list. For those people I recommend working on your basic mechanics of your swing and your footwork into and out of the back corners. Many amateurs have swings that are rotational, which means they don't go directly to the ball, they go backwards and will end up hitting the back wall. I feel for the back wall with my racquet and know if my racquet is set I have room to swing. If I can't get into a regular racquet preparation then I shorten it accordingly. You can also practice with a blue or single yellow dot, or even allow 2 bounces to learn how to time the ball off the back wall. When you start getting better at rotating drives you are now ready for the next step. What can you do to get a good drive out of the corner. Let's take a look. 1) Anticipation of the receiving shot- hitting the ball before or after it hits the back wall. Good players can tell when the ball isn't going to come off the back wall and get there early and play it before it is too late. 2) Footwork - is crucial under pressure. Average club players cheat and hang far back on the T because they don't have a proper split step or court movement from the T to the back corners. Top players can move from a high T position into the back corner and play drives under pressure on their back foot (open stance). 3) Shortening your backswing - when someone hits a near perfect length we can't take a full swing and contact the ball. Elite players can shorten up their backswing and use a flick of the wrist to get the ball back down the wall. The shorter the swing the more height the player will look to use on the front wall to get the ball all the way to tieback of the court. 4) Choke up on the racquet - same as shortening your backswing, players will also choke up their grip. Sometimes even slightly higher than the top of their grip. If you watch good players closely you will see them doing this from time to time. 5) Get low - again when limited for space you need to get low so you can get your racquet under the ball. 6) Open the racquet face - when your backswing is impeded you have to open up your racquet face to get the ball high enough on the front wall. This goes together with getting low, choking up on the grip and shortening the backswing. To dig out a near dead drive you will need to do all of these to get the ball back down the wall. 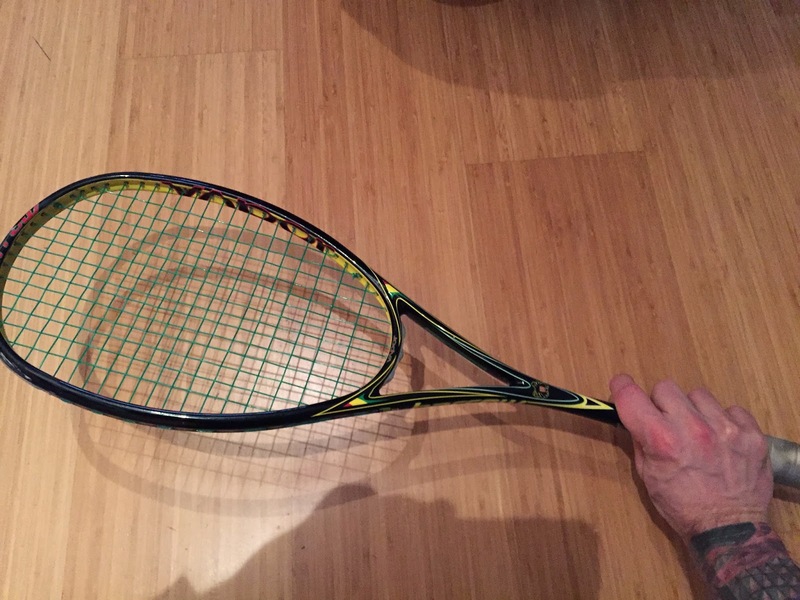 It was tricky to photograph my own hand, but you will see how I have my racquet head back by using my wrist, not my arm. Most people will find this easier to do on the forehand than backhand. But remember, the warmer the ball the easier it will be to get this flick drive back down the wall. Forehand setup (above) for digging out a dying length. Notice just my racquet head going back as I extend my wrist. I am also choked right up on the grip to reduce the circumference of my swing. Backhand setup (above) for digging out a dying length. Notice the very open racquet face. As I won't be able to get as much power on the backhand side with the shorter swing I need to hit the ball higher to get it all the way to the back wall. When you first start trying to implement some of the techniques, just try them on every drive, even if you don't need to. 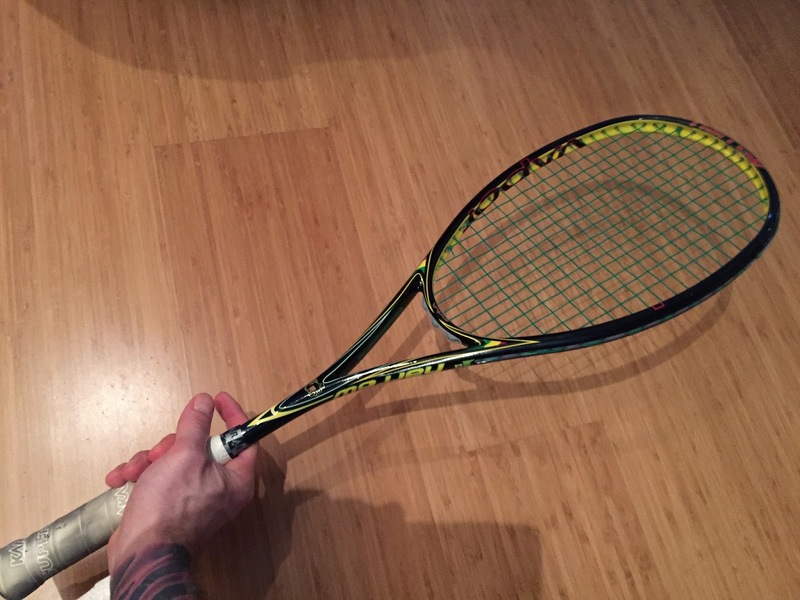 You can start with your grip choked up, your racquet face open and waiting in the back corner. You can slowly work your way up to starting at the T with you standard grip. The best method for not having to boast is to get the ball before it reaches the back wall. But we can't always do this, so to be a top level player you have to be able to hit a good shot under pressure. You can see forearm and wrist strength play important factors in this skill set. Also getting low and playing a drive open stance take a lot of lower body strength and balance. There's a reason why a well weighted drive is such a valuable shot. It's struck nowhere near the tin and most players can't get it back, let alone hit it back down the wall. Final tip to implement these skills: a good way to practice these skills during match play is by not hitting any boasts. That's all for today. Remember to boast because you want to, not because you have to! Thank you that was excellent! Can't wait to try it out! I've been struggling so much with the ball dying out in the back corner, and sometimes I get a the forearm rotation (although I'm not sure if this is strictly good technique). Observing better players, their racquet starts really high but I don't see how this translates into a swing that can get into those tight ones.